The 2006 Alberta Pool Standards introduced our region’s the first written requirement for ANSI/ASME approved anti-entrapment covers and reference to other anti-entrapment devices (SVRS). 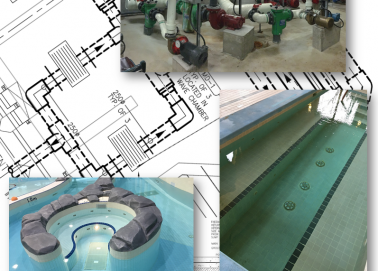 The world of anti-entrapment compliance has gone through a gradual evolution, adding layers of complexity in attempt to create standards that can account for all the potential entrapment hazards in a swimming pool system. I could write a full post just on the evolution of anti-entrapment legislation but I’m going to keep this post more focused and practical. As much as compliance has become more complicated over time, every year the options available on the market grows which makes it easier to come up with solutions to the wide range of installation scenarios that need to be retro-fit to comply with current standards. It also gives rise to another challenge of staying on top of what is available and the unique installation requirements from each manufacturer. We have been privileged to consult, supply, install and test many anti entrapment solutions for over a decade. If you have any questions or need validation of your anti entrapment compliance situation, our ‘Anti Entrapment Evaluator™’ service gives you a custom written report with the relevant details specific to your facility. Here is a summary of some misconceptions we’ve run into surrounding the issue of anti-entrapment compliance. Domed style covers are a popular retrofit design option for smaller suction outlet frames, but like having multiple main drains – it doesn’t guarantee compliance. Newer large area or channel type drain assemblies have the proper anti-entrapment cover certification with the advantage of being flush with the pool floor. This is generally preferable as it eliminates a trip hazard in shallow water and is not an obstacle for pool vacuums. This type of cover still needs to be evaluated for maximum flow allowance and sump compatibility. This misconception involves a gravity supplied suction line and the assumption that there is no entrapment risk without a direct pump connection. The risk of entrapment is higher when a suction outlet is connected directly to a circulation pump, however hazards still exist in a gravity suction system. Entrapment risk includes body suction entrapment (the primary risk associated with the suction force of a pump) but mechanical entrapment (jewellery, swimsuit, accessory snagging the opening of a cover) and limb/hair entrapment (getting a finger into a cover slot but being unable to get it out) are still important considerations. Gravity outlets can still have a significant suction force – remember the tank is filling from gravity at the same speed as the circulation pump is pulling it out of the tank. Installing a SVRS/Auto Pump Shut Off device is enough. These devices can help with solving compliance problems on single main drain installations but an approved cover is still required (and flow rate/sump compatibility are still relevant details). Supplementary anti-entrapment devices still require proper covers are installed.